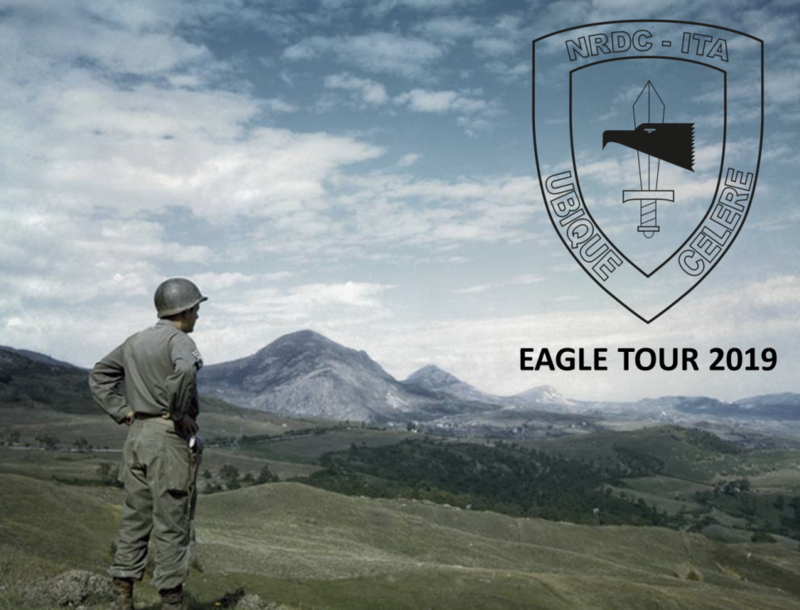 NRDC-ITA's "Eagle Tour 2019", Eagle Tour, - Successfully completed the NRDC-ITA's "Eagle Tour 2019"
HOME > Successfully completed the NRDC-ITA's "Eagle Tour 2019"
Successfully completed the NRDC-ITA's "Eagle Tour 2019"
31 Mar – 7 Apr 19: Senior multinational staff from NRDC-ITA were joined by leaders from affiliated units, to take part in Ex Eagle Tour 2019. This annual activity is aimed at increasing the skills of key HQ planners in the conduct of large-scale and joint operations, by studying the terrain and problems faced by the Allies whilst conducting the World War II Italian Campaign. Having pre-studied the historical realities, the staff examined the Allies maneuvered (Aug 44 to Apr 45) during the assault on the Axis’ defensive positions, the so-called "Gothic Line". The ground, the Adriatic coast, mountainous terrain of Central Appennini and the marsh areas in the Comacchio Valley, provided a difficult environment for the senior leaders to challenge and test their understanding of Operational and Tactical Planning as well as in terms of the strategic Art of War. Useful takeaways were drawn, such as the “army” level planning and executing, both of which NRDC-ITA is currently focusing on in its continuous adaptation process. Eagle Tour proved once again to be a valuable opportunity to study the complexity of Allied command and control and logistical realities in a high intensity conflict scenario. These are exactly the type of problems that NRDC-ITA is engaging with as it transitions to a warfighting Corps HQ following a successful year as the Land Component Commander of NATO’s Response Force.